Warner Bros. didn't mess around this year at San Diego Comic-Con. 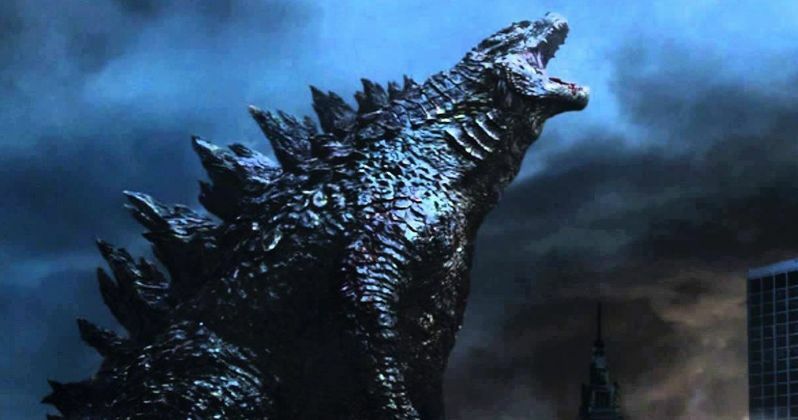 In addition to showcasing Fantastic Beasts: The Crimes of Grindelwald, The LEGO Movie 2 and their future live-action DC movie slate, they finally delivered the first truly epic trailer for Godzilla: King of Monsters. If you're a long time fan, this thing is loaded from top to bottom with monster goodness and we're here to take a deeper look at what's going on in the trailer and what it tells about the story, as well as the future of the studio's MonsterVerse. The Comic-Con trailer opens with Millie Bobby Brown's Godzilla character on a rooftop. What is immediately clear is that this movie is going to have a dramatically different color palate than Gareth Edwards' 2014 Godzilla did. Lots of color. A whole lot of blue. Much less stark. As Brown looks around her, she gets a worried look in her eye, and for good reason. A cloud of ash begins to fill the streets and skyline as she hurries indoors to escape. While this is happening, we hear a cryptic voiceover message from Vera Farmiga's character creep into the Godzilla 2 Comic-Con trailer, about how humanity has doomed itself with pollution and has started to cause their own mass extinction. She then talks of a "fever" that was sent by mother nature to fight this infection. Based on the rest of her speech, and some of the footage (which we'll get to) it sounds like this virus is at least some of the gigantic monsters that inhabit the world these movies take place in. Farmiga talks of the "original and rightful rulers; the Titans." We then see Ken Watanabe's character from the first movie in a submarine exploring some massive underwater ruins. They include pictures of Godzilla on them. These are ancient beings who have been hiding away for thousands of years. Vera Farmiga finishes her warning by saying, "unless all of the Titans are found, our planet will perish, and so will we." While she's saying this, we get a glimpse of Godzilla with his back lighting up in awesome fashion, as well as our first shot of King Ghidorah, who appears to be frozen in a massive block of ice underneath the Earth. It's a very cool shot, even though the classic Toho monster isn't actually in action. It then transitions to a quick shot of some burning land. Everything is colorful, but the footage transitions from beautiful blue to firey red a lot. It's playing with the contrast laid out in Farmiga's speech. We then move onto one of the most important shots of the trailer. Millie Bobby Brown slowly approaches one of the monsters who, though gargantuan, appears to be very friendly. It's Mothra! Another epic shot of Godzilla emerging from the ocean to blast his atomic breath into the sky is intercut before we actually see Mothra reveal herself. She's been redesigned, but looks quite incredible. She glows blue in the footage and, though different from the classic Toho design, it looks very faithful and majestic. The trailer then transitions to a shot of a volcano exploding, not erupting. This looks like a full-blown natural disaster and, well, it is. We see none other than Rodan emerge from the volcano looking all kinds of pissed off. We then see some shots of various human characters. Some military dudes who are ready to go to war with these monsters are looking quite nervous, with one silently praying, looking prepared to die. Kyle Chandler's character yells that Vera Farmiga is out of her damn mind, to which she says "it's the only way." What they're talking about specifically isn't clear, but what is clear is that Farmiga's character is in deep with these monsters and seems to think they're the key to mankind's salvation. There's also clearly a lot of family tension. Millie Bobby Brown is the daughter of Farmiga and Chandler and, even aside from the worldwide destruction going on, they have some issues to work out with one another. Following a few seconds of human stuff, we get back to Rodan, who is seen only in shadow flying above a town and absolutely laying waste to it with the sonic blast from his wings. He's being painted as the "bad guy" monster here. There is then another montage of human shots, some with action, some more emotional. Millie Bobby Brown looks longingly at a photo of her family on a tablet. She then huddles in a corner and screams, putting her hands over her ears as the house she's in shakes. There is then a quick shot of Rodan flying above Washington D.C. which is turning to ashes. There is a stream of bullets flying, rather helplessly, in his direction. Brown then looks at Vera Farmiga and says, "you're a monster." Ouch. It's then onto another quick action montage. A shot of Godzilla looking in a window at Brown. Fighter jets doing some serious Top Gun stuff trying to fight Rodan, totally uselessly. Then we get what is arguably the money shot. King Ghidorah, in the flesh. He's bathed in fog and shadow, so we only really see his outline, but he's all there and clearly not on the side that bodes well for humanity. Charles Dance then drops the mic by, in the most badass fashion, saying, "long live the king." There's another quick action montage with an amazing shot of Rodan clapping his wings together and blasting into the sky. We then get to the conclusion shot where Godzilla earns his money. Against a blue background with flashes of lightning, he roars triumphantly, probably at King Ghidorah off screen, with a barrage of fighter jets along with him, seemingly joining the fight in his favor. It's, in a word, awesome. Fade to title card. It looks like the humans are going to side with the King on this one. What this really tells us, more than anything, is that there are a lot of monsters in the world. Some good, some bad. By the looks of things, it's going to be a tag-team match of Godzilla and Mothra vs Rodan and King Ghidorah. Let them fight. It also looks like this movie is going to explore the lore of this MonsterVerse quite a bit more and, unlike Gareth Edwards' movie, there is going to be a ton of monster action. It's early, but this is a stellar first look at Godzilla: King of the Monsters, which arrives in theaters on May 31, 2019. You can have another look at the trailer, courtesy of the Warner Bros. YouTube channel, for yourself below. Godzilla: King of the Monsters 5-Minute IMAX Preview Is Playing with Shazam!